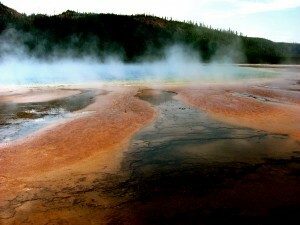 A story by SciCom's Beth Marie Mole on the AGU "GeoSpace" blog described the extreme metabolic skills of microbes living in Yellowstone's hot springs, with photos taken by the author. 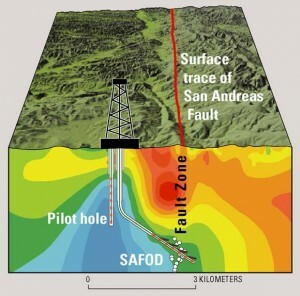 A popular science blog run by the American Geophysical Union featured news stories reported by SciCom students during AGU's annual fall meeting, held December 5-9 in San Francisco. The program's graduate students reported for GeoSpace, a blog covering Earth and space sciences. The students scoured the talks and poster sessions at the meeting for stories unreported by the large press corps that covers AGU each December. The two dozen articles posted by SciCom's journalists-in-training included: using chemical traces in dinosaur eggshells to reconstruct the Cretaceous environment; detecting lightning on Venus by the Venus Express orbiter; new measurements within the ocean's deepest trench; concerns about arsenic in rural water supplies; and a surprising finding that warmer weather makes some flowers bloom later, rather than earlier. The AGU blog was edited by Kate Ramsayer, a 2003 graduate of the Science Communication Program. Before joining AGU earlier this year, Ramsayer was an environment reporter for the Bend Bulletin in central Oregon. AGU's news office is run by Peter Weiss, a 1990 SciCom graduate. Writing for AGU was the capstone of one of SciCom's fall courses, an examination of social media and online networking in science journalism taught by Nature reporter Erika Check Hayden. As one of their projects for that course, the students created and published a class blog about research and science journalism based in central California, called The Crashing Edge. Nearly 20,000 scientists attended AGU, making it the world's largest assembly of Earth and planetary scientists. The five-day meeting occupied most of the sprawling Moscone Center conference facilities in downtown San Francisco.